The email was sent to Corey during her latest correspondence with Facebook regarding her Photo Stealers page, but we’ll get back to the reason for that in a bit. After checking the matter for the past two weeks, a Facebook Sales Representative responded to Corey with a very unsettling email. “I understand that you are trying to protect other photographers and consumers by calling out others who are posting photos copyrighted by others, however, once something is posted or uploaded onto Facebook it becomes Facebook’s property. So if the original photographer uploaded the photo first onto Facebook and then others have taken it from there and uploaded it to their pages or profiles, this is legal and within policy, there’s nothing I can do about it unfortunately even if they are taking credit for the photos”. For content that is covered by intellectual property rights, like photos and videos, you specifically give us the following permission, subject to your privacy and application settings: you grant us a non-exclusive, transferable, sub-licensable, royalty-free, worldwide license to use any IP content that you post on or in connection with Facebook. When you publish content or information using the Public setting, it means that you are allowing everyone, including people off of Facebook, to access and use that information, and to associate it with you. 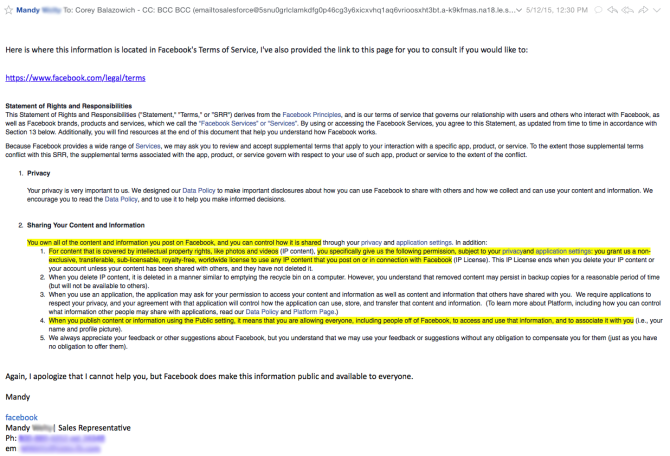 The second email basically states that you own the rights to your photos but you give Facebook permission to do whatever they like with them. It also says that others may use your photos and to associate them with you. This is somewhat relaxing as it contradicts some of what was said in the previous email, but is still enough to keep some photographers up at night. The third sentence is very vague and my guess is that it was written that way on purpose. It’s a clause that reduces the company’s responsibility and workload, that will probably be changed once it is challenged (or threatened to be) in court. So while the terms might not be as terrible as initially stated, the fact that an official representative thinks those are the rules is a major problem. To make things even worse, the rep said that she had consulted her supervisor and Facebook’s help center, which means they are all under the impression that Facebook actually owns your photos – and they enforce this incorrect policy. You might have noticed that the first email stated that “If these people are attacking you for pointing out that others are taking credit for work that is not theirs then this could be technically considered a violation of the community standards – both what you’re doing and what these people are doing to you”. So not only does Facebook allow your photos to be used freely by other members, it turns out that pointing a finger at people who “borrowed” other peoples’ photos is against the company’s rules. This is the reason any post Corey makes on the Photo Stealers page leads to the content being deleted and her account restricted, and it was during her attempt to get the page back up that she received the above emails. We’ve reached out to Facebook with several follow up questions regarding their policies and our rights as photographers and will post an update once they respond. “The information given in these emails is incorrect. Our terms are clear that you own the content you share on Facebook, including photos. When you post something, you simply grant Facebook a license to use that content consistent with our terms, including displaying it to the audience you’ve shared it with. It will be interesting to see if the mess this story stirred will cause Facebook to respond to copyright claims faster than they have been doing so far. Glad to say I am not dumb to share my money shots online. All my photos I share are for sale but they are also free to download as well. They are NOT saying they “own” your photos, only that a copy becomes their property under a very permissive license. Don’t like that license? Don’t upload your photos under it. It is also NOT stealing to just follow this license, and getting angry while saying otherwise can very easily become harassment. I don’t upload to Facebook precisely because of these Terms Of Service. If you do, it’s your problem. as stated earlier; nothing new, and this have been know for years. I never upload photos (unless they are utterly useless for anything else) to facebook, I only link to them …. This pops up every couple of years. And this time around is no different. it`s still not true. Mandy should stick to sales…she’s not real bright. they can claim anything they want. i shot them, i own them! take me to court! Why would they want to own a billion drunken selfies? Apparently we now know what the F in Facebook stands for. F them and what they might claim. Facebook representative is a dumbass. Nothing new here. You grant Facebook everything but ownership. The issue here isn’t ownership. They’re pretty clear on it. You own the photo. What this outlines is that if you provide a license to Facebook which is very broad. You can revoke that license by deleting the photo, but if it’s been shared, the license persists. Yeah, I agree with others here… Nothing new. Pinterest, Google+, blog service providers et.al. might be equally if not more restrictive. The bottom line is Read those Terms and Conditions. Too many users of these services just blindly click I Agree without reading all that boring legal junk then they wonder why they lost their rights to their works. There is no excuse for not trying to protect your rights and just don’t post on sites with these types of ownership statements but then what does one expect for free. They don’t charge you but they’ll get you some other way. Just for the record, I did not add the link on the word et. al. in my above post. I have no idea how or why it got there. I think the interesting part here is that Facebook reps don’t read it either. So I wouldn’t be surprised if they did abuse copyright. Thus copyright holders must be vigilant. This is standard boilerplate language on any website – it essentially covers their tail legally for your images showing up on their servers. It’s very true. If you upload a picture that you named “Phil Zepeda” facebook algorithm is to save it to their network and rename it (1000_1000_1000) or something like that.